Headius: JRuby on ME Devices? 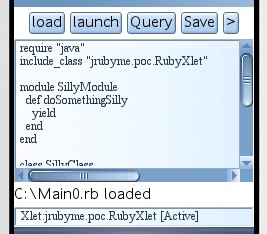 Roy Hayun presented his "JRuby on ME" talk this past JavaOne and got a pretty solid response. He ported a pre-1.0 JRuby to CDC by incrementally stripping out libraries and functionality that couldn't be supported. He succeeded, and yesterday delivered to us a buildable version of his JRubME 0.1 (that name was a typo on his original JavaOne submission...but the missing 'y' produced a comically good name). There you go! You wanted JRuby on ME, now you have a damn good start! Run with it! I am a ruby expert,but a j2me newbie. any set of instructions for getting some gui app working on my j2me mobile. You could create some Java method that adds UI components and call this method from your Ruby script. How do you install JRubMe. My LG KP500 gives a error about "File is corrupt or invalid manifest" when I try to install the .jar file. I also already copied the java.policy and main0.rb files to the same directory as the .jar file. So I copied all files from the folder "dist" in the JRubMe0.1.zip. Does anyone know how to get this great stuff running?